What Color is Haitian Jesus? And so I ask you, what color is Haitian Jesus? That is not to say there are multiple Christian deities. No, I am speaking specifically of how Jesus is depicted in Haitian art. And, before you answer that, I’ll also posit, what color were the disciples? Or how about John the Baptist? The Three Wise Men? How about the Virgin Mary? Take a moment to write down your answers…. Last week I visited the El-Saieh Gallery in Port-au-Prince, Haiti. The gallery is formerly the private collection of the current owner’s grandfather, Issa El Saieh, a renowned big band kompa performer in his day. His granddaughter, Sheron, converted the mansion and the collection into a public art gallery, yet the whole place feels like it’s the type of museum Haiti is missing. Every inch of space within the building is covered in art. 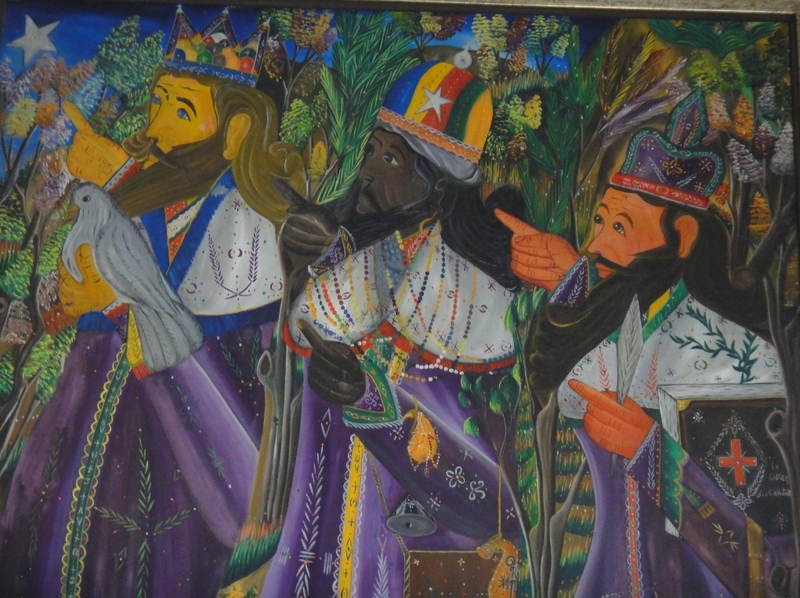 Paintings adorn the walls, marking Haiti’s history with each vibrant stroke. The hallways are crammed with paintings stacked one in front the other, and lean next to tables also piled high with unframed paintings. You could spend hours within the gallery and still only manage to have seen a fraction of the art contained within. 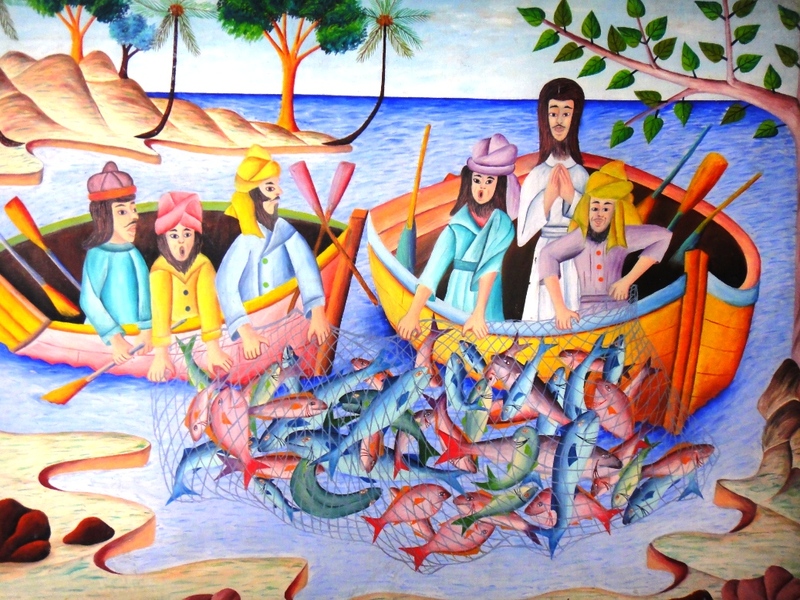 Haitian art is as varied as the people. Some art is strongly influenced by voodoo imagery, and looks like it belongs on the cover of a Funkadelic album. 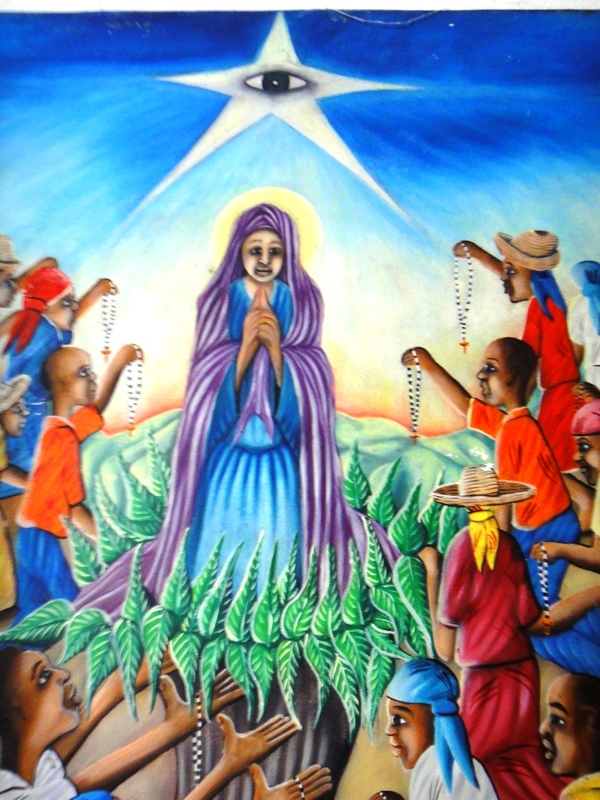 Other art paints in great reverence Haiti’s historical leaders. And some art invokes the tragicomedy that is often the life in Haiti, taking everyday universal scenes and placing them in the Haitian context, such as this one of a woman cheating on her husband with a younger man. And, still, other art tells more when lined up in a series. In the foyer of the room is one such painting. The Three Wise Men feature prominently on the back wall of the gallery’s main room in the lower floor. An art critic could spend hours or pages describing in detail all the imagery within the painting. For now, to be basic while still maintaining the veil of an art connoisseur , we’ll focus just on the race. In short, the Three Wise Men are Black. Perhaps they’re meant to be a variety of ethnicities representing a historical aspect of Haiti’s culture (the arrival of the first wave of Libyan immigrants, for example?). At the same time, we can be sure that the Three Wise Men, depicted on their own, are not definitively white. This painting set me on a path to look for more religious imagery, which we find in the image at the top of this article. As is shown, one sees the Virgin Mary surrounded by followers. Everyone in the painting is Black. It’s important to point this out, because in Haitian art, the person being revered or the person in power tends to be white. Whether it’s a depiction of a slave scene or simply of a woman’s beauty, the person at the center of the painting is usually white (or a very fair shade of Black). Yet here, everyone is the same color. 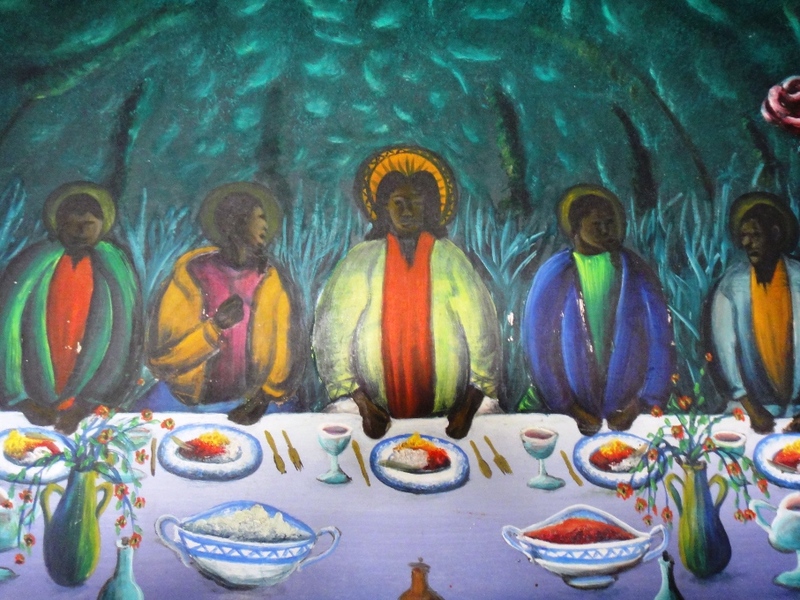 When it comes to Jesus, however, it seems everyone else is Black, leaving Jesus to standout more than what would be normally expected in a religious painting. My favorite example of this in the gallery is a depiction of John the Baptist baptizing Jesus. 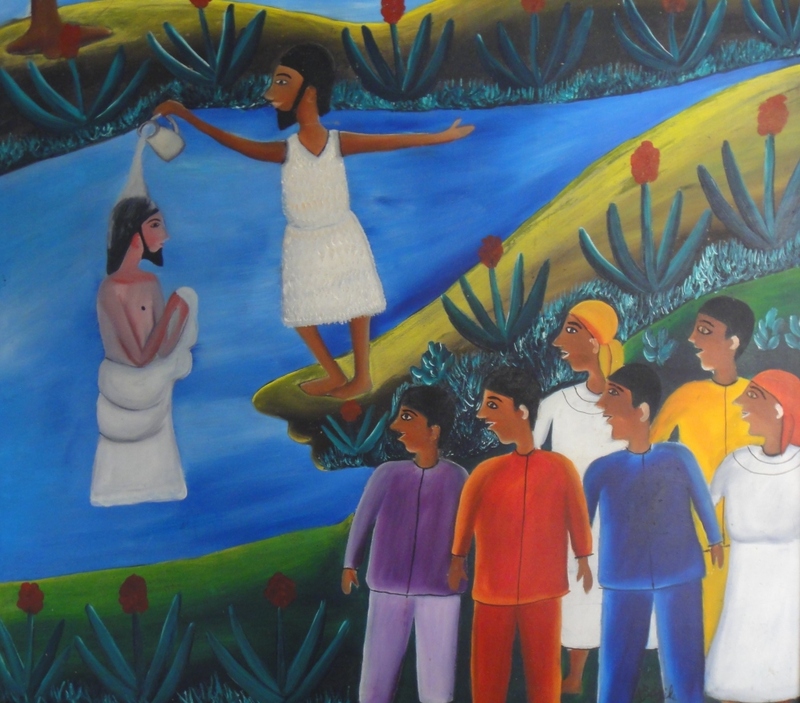 The scene contains onlookers in the foreground, all Black, as well as John the Baptist, also Black, baptizing Jesus, white. The message is uncanny, but the true gravity of the piece takes a moment to sink in. Finally, it hits: you mean even in a Black country where the people and important figures in religious history are depicted as Black, Jesus still has to be white? For any Christian painting, I imagine the image of Jesus would figure prominently. Yet, this painting has added an extra layer of “heavenliness, ” by depicting Jesus as white amidst a sea of Black followers and a Black baptist. In another painting, depicting the miraculous catch of fish from the book of Luke, Jesus and the disciples are painted white, though admittedly the fish are a variety of colors. And, after further scrutiny, perhaps Jesus isn’t white exactly? After all, Haiti does boast a sizable and influential Libyan population. Perhaps the images in this painting bear homage to middle eastern influence? Yet, as is always the case in Haiti, there are no stereotypes. In another hallway I stumbled into not one, but two images of Jesus painted Black, both of the same scene: the last supper. 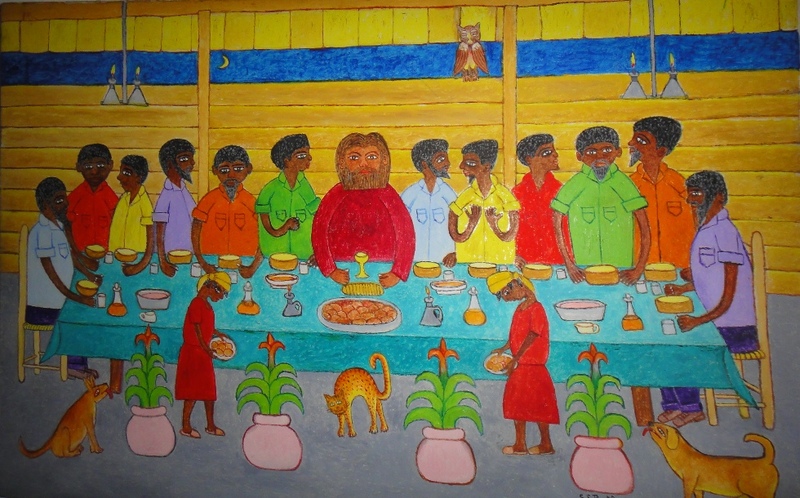 In this scene, taken on by two different artists, Jesus is undeniably Black, as are his disciples. Why this is I’m not sure. Perhaps because it’s a scene behind closed doors where no one else can look. Perhaps it’s a moment where Jesus can be equal to his disciples, thus not having a need for whiteness. After all, the disciples were his closest compatriots. What need would one have to “put on airs,” as is often said of those assuming a perceived identity of whiteness around others? Still, the answer may be as simple as artistic preference. Some artists wish to paint him white, others Black, others a melange of colors. All the same, I find it rather peculiar to paint solely Jesus as white when all those around him are Black. And yet… I would absolutely buy the painting, if not for the story alone. This entry was posted in Uncategorized and tagged art, color, gallery, haiti, Issa El-Saieh, Jesus, John the Baptist, Virgin Mary. Bookmark the permalink. 8 Responses to What Color is Haitian Jesus? I particularly like this line: Perhaps because it’s a scene behind closed doors where no one else can look. Perhaps it’s a moment where Jesus can be equal to his disciples, thus not having a need for whiteness. After all, the disciples were his closest compatriots. What need would one have to “put on airs”. even Jesus knows how to pass lol. 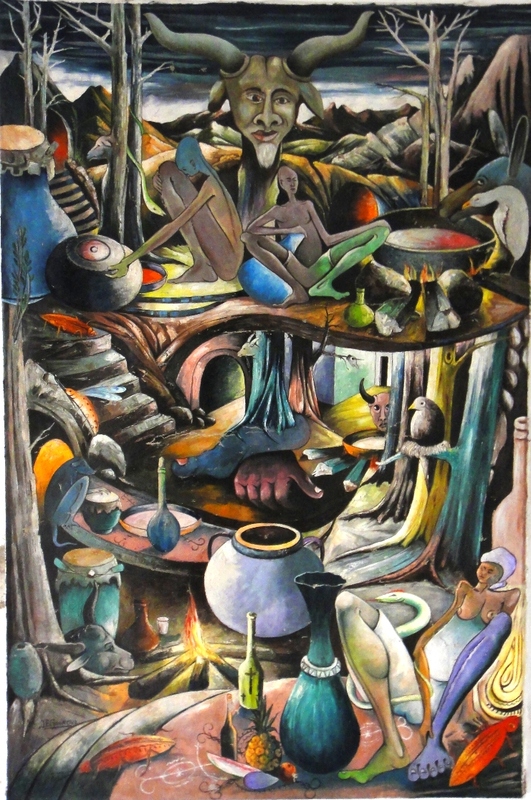 Enjoyed this article on Haitian art and absolutely loved the art. Hello my brother, Jesus has no color. He is a prophet of humanity. Reconstruction Reconsidered: Is It Excellence? Enter your email address to subscribe to Sak Pase Diplomacy and receive notifications of new posts by email.